Today, I want to discuss the MLM Failure rate. I also want to discuss WHY people fail in MLM, and what to do about it. This is a controversial topic that very few people really understand. It definitely gets taken out of context a lot and gives our industry a bad reputation. My goal today is just to clarify things so you can see both sides of the story. 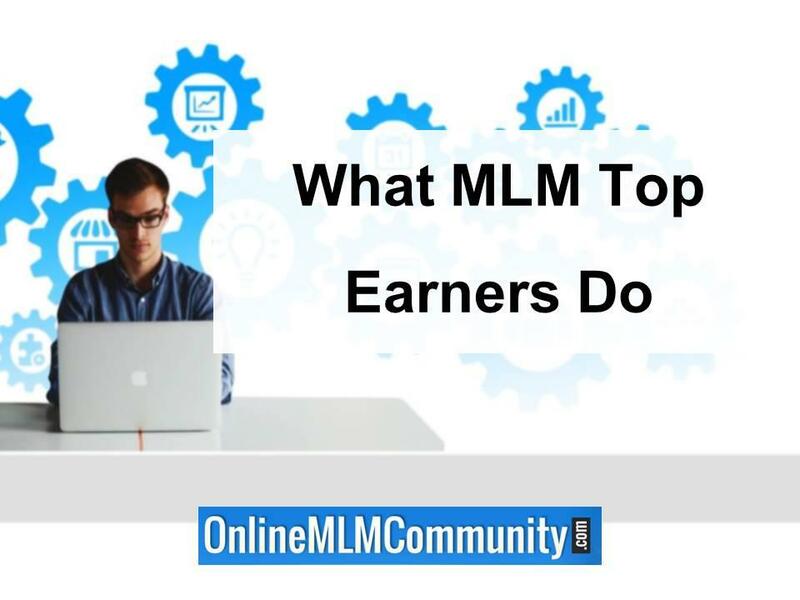 I’ve read countless articles and blog posts online stating that only a small percentage of people who get involved with network marketing actually make a profit, and a very TINY percentage of those people earn a substantial or full-time income! If you read any company’s “average earning’s statement” you will find that only a very small percentage of distributors make a full-time income with the company, about one percent of the distributors, and sometimes even less than that. A decent amount of folks earn between $100 and $300 per month, and a small group of people earn $500 to $5,000 per month, but MOST people don’t earn anything at all. Yes, these numbers do vary slightly by company, but the bottom line is that most people in our industry do not make money with their network marketing business. Everyone who joins our industry has a different definition of success. Everyone has different goals for their business. Some people simply want a discount on products, so they sign up as a distributor to get the wholesale price. Others want to earn a few hundred dollars per month. Believe it or not, some folks who join just want to have fun and be part of a social club. And some people want to make a full-time income. To me, failure is when you don’t reach your goal. As an example, if your goal is simply to earn enough money each month to get your products for free, and you accomplish that goal, you are not a failure. Instead, you are a success! To say that everyone who does not earn a full-time income (or even a certain income) in network marketing is a failure, is very misleading in my opinion. First and foremost, are the product users. Believe it or not, not every joins a network marketing company to make money. Many folks sign up as distributors just to get the discount on their personal purchases. I’d bet approximately 50 to 75 percent of my personal team falls into this category. Are they MLM Failures because they don’t make much money? Heck no. They’re just happy product users. Saying these folks “failed” in MLM is far fetched to me. The next group of people in network marketing is the people who get in and do nothing to actually build a business. When you exclude the product users, I believe this number represents at least 8 or 9 out of every 10 people who join our industry. This is the person who joins with the desire to make money, but doesn’t do the work. They don’t share the business with others, sponsor anyone or sell any products. They aren’t coachable and they won’t follow the team’s success system. If you’ve been in the business for less than a year, and you drop out, you are not a failure. Instead, you are a quitter. You can’t fail at something you haven’t started, but you can quit. If you haven’t been in the business a year, shared the business with at least 100 people, attended a few events, and worked on your personal development, you haven’t even STARTED your business. Don’t confuse the words quit and fail. They are two totally different things. The third type of person who joins our industry is someone who sees the value in the business opportunity and COMMITS to the business. They’re committed to doing SOMETHING to grow their business every single day. They’re committed to promoting ONE company and they realize it takes a few YEARS to build a successful business of any kind. They’re coachable and will follow the lead of their sponsor or mentor. For every 20 people who join the business, only about 1 of them falls into this category. The rest are either product users, people who want a social club, or people who do nothing. In the paragraphs below, I want to share the top 12 reasons why people fail in MLM, as I see it. 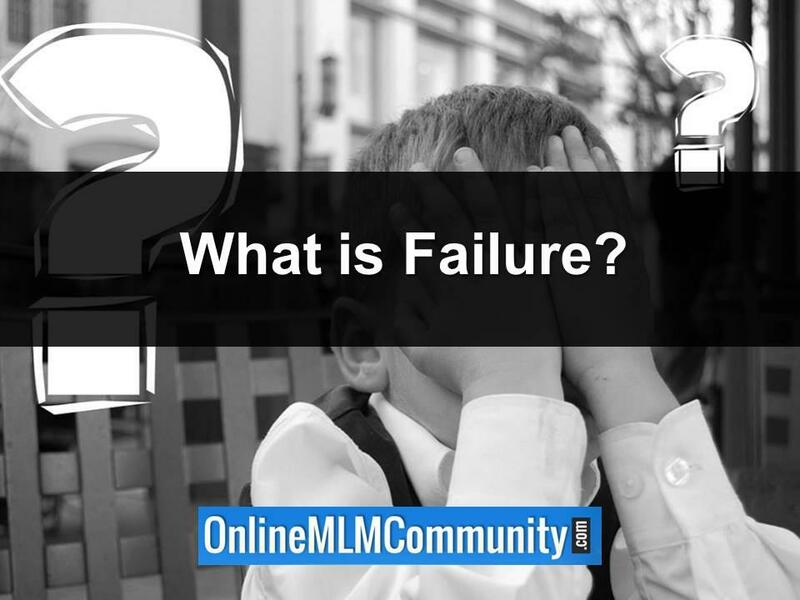 Without a doubt, one of the biggest reasons people in fail in MLM is because they will NOT approach their warm market about the products or business (or they won’t do it the right way). This is a warm market business. Everyone should start out by contacting their warm market to notify them about their new business. Why? Because it’s easier to sponsor someone you know than someone you don’t know. Plus, everyone knows at least 1,000 people by name. Why venture off and approach strangers before you contact these folks first? If you were going to start a new traditional business, you would contact your warm market to notify them about what you are doing, and to ask for referrals. You should do the same thing with your network marketing business. When it comes to working your network marketing business, you must be disciplined. Most people do the business part-time. After coming home from a long day at work, most people do not have the discipline to work their business each day. Without discipline, you will really struggle in your business. To succeed as an entrepreneur in ANY business, you need discipline. To manage your own time effectively, you need discipline. 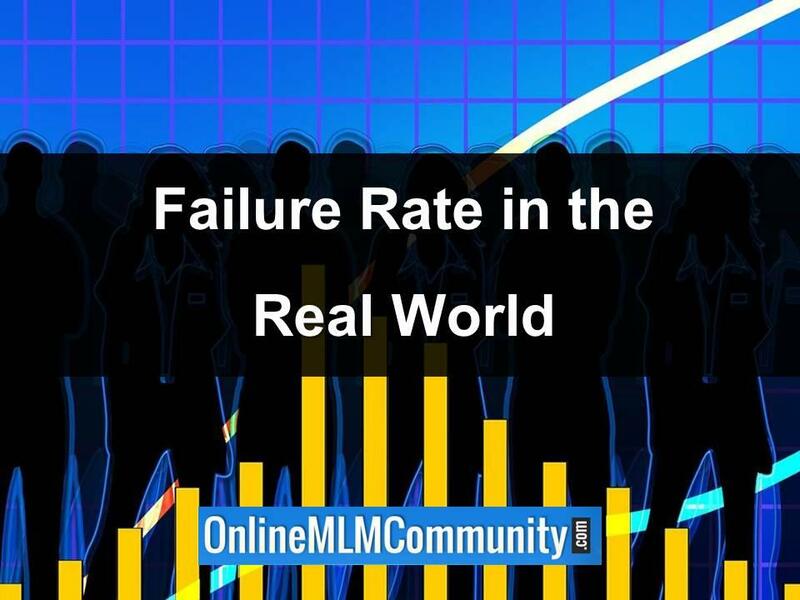 You could argue that this is the # 1 reason for the high failure rate in the MLM Industry. Here’s the truth: when you only have $50 to $200 invested in a business, it’s easy to put your business on the back burner when life gets busy. Someone who starts a traditional business can easily invest five to six figures just to START their business. Plus, they have high monthly overhead costs and they must work their business 60 to 80 hours per week to get it going. Why do they do this? To protect their investment. Because they have so much money invested in their business, they do EVERYTHING in their will power to make it a success. You must adopt that same mindset if you want to succeed in MLM. You must be “all in” emotionally, even if you are building your business part-time. You can’t dabble with the business or just have one toe in and expect good things to happen. This is the kiss of death in our business. To be successful in network marketing, you must be persistent and consistent. Do something every single day to grow your business. If you can work your job 8 to 10 hours per day, you can easily commit to working your MLM Business one hour per day. What most people do is approach a few people, get a little bit of rejection, and then stop. They take a week or two off to rebound emotionally and then start again. Or, they work their business hard for a month or two and then stop because they haven’t gotten the results they thought they would. Could you imagine someone who owned a restaurant starting and stopping? Because they had a bad day on Wednesday, they shut down their restaurant on Thursday, Friday and Saturday. That would never happen in the regular business world, but it happens daily in our industry! Focus is key in this business. One of the reasons so many people in our great industry fail is because they do not focus. They either promote multiple MLM Companies at once, which I do not recommend, or they are scattered brained trying several different business building strategies at the same time. Or even worse, they focus on the wrong activities in their business. They confuse busy work with being productive. Smart network marketers spend their time on the income producing activities. They always keep the main thing the main thing! The employee mindset will DESTROY you when you start your own business. Employees trade time for money, whereas business owners get paid to produce. When you own a business, no production equals no money! When you start a new business of any kind, you will generally work for less than minimum wage during the early period of your business while you launch it and grow it. As your business grows, normally your income does too. Many new network marketers start their business, work 20 to 30 hours their first month, don’t make much (or any) money, and then quit. To succeed in this industry, or entrepreneurship, you must practice delayed gratification. Many network marketers fail because they fear rejection. They fear failure. They fear what others think, say or do. Or even worse, they fear success. Fear can paralyze a new distributor, and it normally does. Until you can learn to be mentally tough and detach yourself from the opinion of others, you will be on an emotional roller coaster, and you probably won’t survive in our industry. Most new reps are not coachable. Even though they have no experience in the industry, they think they have a better way to build the business. They think their education, title, credentials or work experience gives them a cutting edge over their successful mentor. This was my biggest mistake for nearly a decade in this industry. Network marketing is about duplication, not doing it your own way. You need a system EVERYONE on your team can follow and get a predictable result. Do not make the mistake of trying to reinvent the wheel, especially if you have never done network marketing before. Many people join our industry with the lottery mentality. They have unrealistic expectations about what the business can provide them. Here is the truth, just so you know. The goal your first year in business is to learn and survive, not get rich. By your second year in business, you should be profitable and improving your skills. By your third to fifth year working your business (all still in the same company) you should be earning a great income. Thinking you will make big money your first year or first month is unrealistic. It’s possible, but unless you have the skills, contacts and work ethic, it will never happen. To succeed in network marketing, you need to build up your specialized knowledge. You need to master a few basic skills. This takes time, especially if you are new to sales, leadership, marketing and entrepreneurship. You cannot expect to make the big money if you don’t have those skills. That’s why you need a mentor. That’s why you need to plug in to the weekly training and attend all events. That’s why you need to work on your personal development. Skills pay the bills! The best way to master these skills is to get in the trenches, do the work, learn from your mistakes and work with your mentor! All businesses need a business plan and marketing plan. As you work with your sponsor, or mentor, they will help you develop a game-plan on how to get started right. Make sure you follow their game-plan. You can’t just wing it and expect much good to happen! Most new MLM Reps never get started right. What does getting started right mean? It means you need to LAUNCH your business. Amateurs start their business whereas professionals LAUNCH their business. This means that in your first 72-hours you need to do the getting started training, make your name list and contact your first 100 people. By doing those things, you give yourself a fair chance to succeed. It’s much better to start right than start over! When you study the successful people and the unsuccessful people in any industry, you start to notice patterns and trends. Simply put, successful people do certain things in a certain way, whereas unsuccessful people do things differently (or they don’t do anything at all). Here are some of the patterns and trends I’ve noticed from top earners in the network marketing industry. Are there any exceptions to this list? Of course, there is always an exception to every rule. 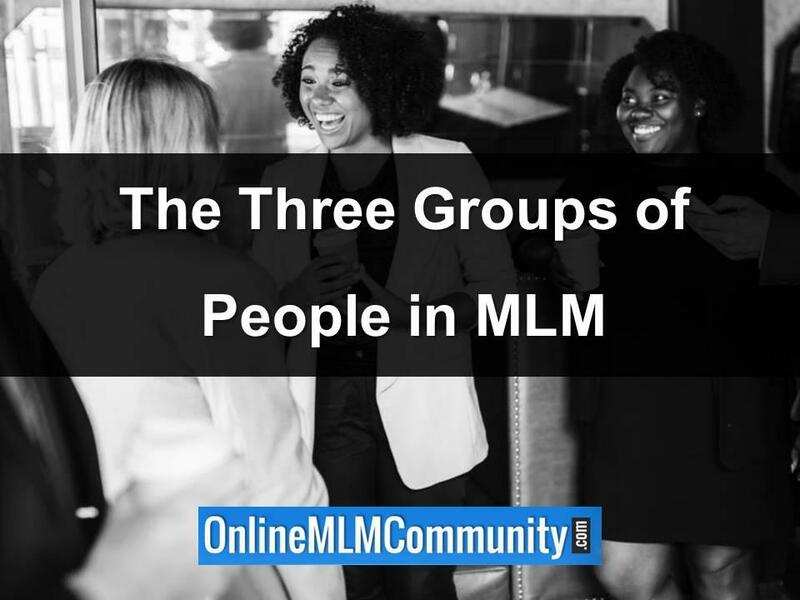 But for the most part, these are the major differences I’ve found between the people who make it big in network marketing and the people who fail in MLM. Furthermore, I think it’s equally important to compare the failure rates (quit rates) in the MLM industry to other things in life. You see, you have to put things in context. You have to compare apples to apples. I want to show you a few examples of failure (quitting) so you can see things from a complete perspective. Here are a few facts about failure that you should know about (sources are cited). 95% of all blogs fail. According to a recent study 95% of all blogs haven’t been updated in 120-days. In other words, the blogger gave up on their dreams of having a successful and profitable blog (Source). Nearly 50% of marriages fail (source). This varies by age, gender, race, and by state. 70% of small businesses fail in the first 10-years (source). Most people, a large majority of people fail with diet plans. They lose weight temporarily and then gain most of it back (source). 67% of gym memberships never even get used (source). Ask any real estate or insurance broker how many people they have to recruit to find someone who PRODUCES. Ask them what percentage of their recruits drop out and don’t earn anything at all. I think you will quickly discover that most realtors never sell one house and most insurance agents never sell one policy! The truth is, selling is not for everyone. It is typically a tough profession with a high turnover. Just ask any sales manager in any company! In addition, entrepreneurship is not for everyone. Most businesses fail! Don’t believe me? Just drive through your town or city and look at all the vacant spaces and closed down businesses. Finally, most people fail/quit in everything they do. Most people QUIT their diets, marriages, savings plans, New Year’s Resolutions, fitness plans, and just about everything else in life. Most people are good at STARTING something, but horrible with the FOLLOW THROUGH. Why would MLM be any different? In most cases, you will never see a blog, forum post or online article about any of these topics being a scam. Yet, everyone and there brother will plaster the Internet writing stories about why the network marketing company they worked with is a scam. It absolutely amazes me and annoys me at the same time. Here’s the bottom line. You can succeed or fail (quit) in anything you do. Rather than spending all your time studying and reading about the failures (and quitters), why not study the successful people? Why not find out what the successful people did to become successful and then simply do what they did? In my opinion, that is the quickest way to become a success yourself. Furthermore, just because you didn’t achieve success with something does not mean it was a scam! Yes, you have freedom of speech and can call it whatever you want to. But before you label our industry a scam, why don’t you call everything you quit a scam? Once again, it’s also important to differentiate the difference between failure and quitting. Most people don’t fail at things: they quit things. And there is a big difference between the two. Here’s why. If you get started with something, learn from your mistakes and keep pressing forward, you will eventually succeed. That’s how we succeed in life: we FAIL our way to success! That’s how we learned to walk. That’s how we learned to talk. That’s how we learn everything. Most people simply don’t have the vision, the discipline, the work ethic and the perseverance it takes to succeed in network marketing on a grand scale. 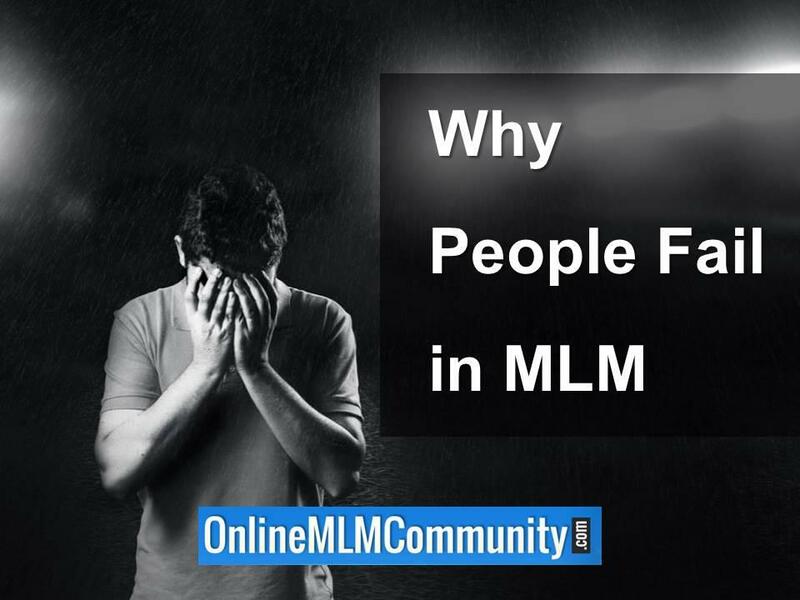 What are your thoughts about why people fail in MLM? 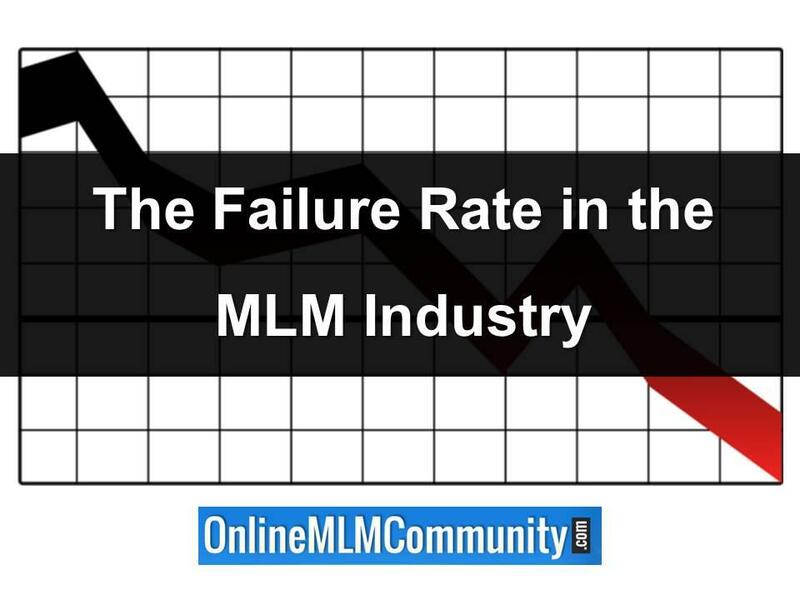 What do you think about the failure rate in the MLM Industry? What do you think about the network marketing industry itself? Please leave a comment below and share your thoughts. I look forward to hearing from you. Thanks. You get out what you put in. If you just dabble with it, don’t expect much to happen. 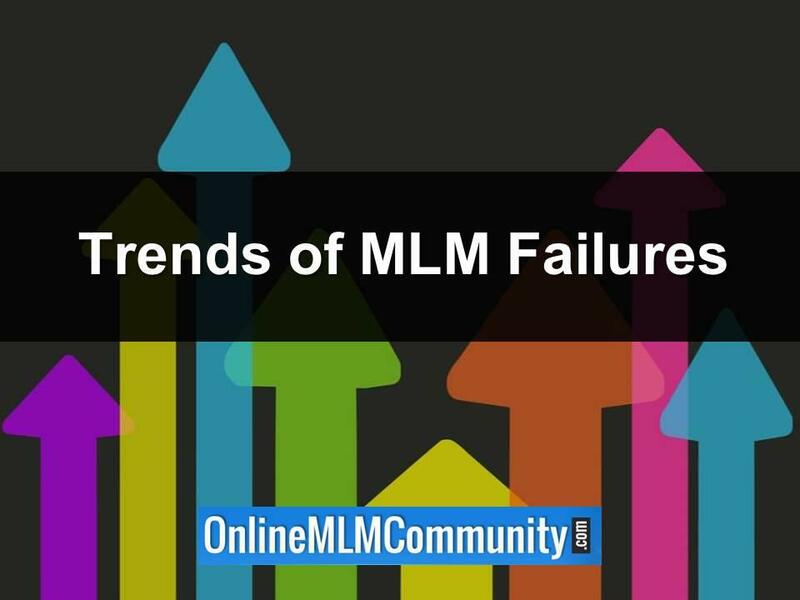 After reading the article and the comments, I don’t believe many people fail in MLM. Instead, I believe that most people quit. In every type of business there are failures and successes. There are MANY factors as to why people succeed and why people fail. Network marketing is no different. Study what the successful reps do and you will see trends. Study what the failures do and you will see trends. Owning a business is not for everyone. It is very hard work and requires a unique set of skills. 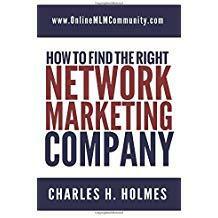 What I love about MLM is that it is so inexpensive to join. Plus, you will learn some great skills that can help you in all aspects of your life. Great points, Parker. While most people fail in the MLM Industry, you really could argue that most of them quit. Most people don’t even give themselves a fair shake at success. Trying something for 90-days, especially a business, is not enough time to know if it will work, or get really good at it. You really need to give yourself at least a year, and show at least 100 presentations. Attend some events, educate yourself, put in the work, and then decide if it has the potential you are looking for in a business. Nice elaboration Chuck. You gotta give yourself time to succeed. My friend owns a little grocery store. He said it took him three years to make a profit, but after five years of hard work it was a cash cow. He understood the importance of paying your dues and putting in the hard work. Not going to lie these are pretty much all the reasons why my first MLM completely and utterly failed. I’ve given myself time to reflect and figure out what I did wrong so I can come back with some better business tactics. Reading your blog has really helped me get my inspiration back. Thanks for the comment. Most new businesses fail. That is normal. It takes time to learn how to build a successful business of any kind. The goal your first year in ANY business is to learn and survive. If you learn something from the experience, you didn’t fail. I think the biggest challenge in our industry is the low cost of entry. Because of that, we do not have a screening process like most traditional businesses do. In the traditional business world, if you can’t afford the start up costs or get funding, you won’t have a business. Not so in MLM because anyone can afford it. The most successful MLM Reps I’ve ever met treated their MLM Business just as seriously as someone who laid down a couple million dollars to start a McDonald’s. That is the mindset you want to have if you want to succeed in this industry. You won’t dabble with it and accomplish much. You can’t be a leader and a people pleaser at the same time. As a leader, your job is not to be liked. Instead, your job is to be respected. If you focus all of your time and energy on pleasing people, you will drive yourself crazy. No matter what you do, you will never please everyone on your MLM team. Accept that and push forward. As a sponsor, your job is to help make sure people have a good experience in the company, whether they stay or leave. That means you treat everyone with respect, you give people realistic expectations and you never use hype, pressure or deceptive recruiting techniques. To succeed in network marketing, you must adopt the refuse to fail attitude. You must DECIDE that you are going to be successful in the business no matter what. If you’re constantly doubting yourself, your prospect will sense it. Or even worse, you will do something to sabotage your own success. When you feel like quitting your MLM business, realize that all businesses start slow. It’s normal to feel frustrated and have doubts. You must learn to master your emotions if you want to succeed in this industry. Also, you need to give yourself a fair chance to succeed. Most businesses in the real world take at least one year just to make a profit. If you’re expecting to create big money or easy money, right out the gate, you have unrealistic expectations. You always find what you are looking for. If you are looking for a reason to quit the business, you will find a reason to quit. If you are looking for a reason to stay in the business, you will find a reason to stay. Thoughts are things. Get your thinking right and focus on the good! If people aren’t quitting you aren’t building fast enough. This is a business of attrition. It always has been and always will be. No matter what you do, most people are going to quit: even if you build a team for them. Be so buy sponsoring new reps every month that you don’t have time to worry about the people who quit. If someone quits, they had negative energy. Please realize that. If you’re spending your time and energy focusing on the people who quit, you are doing yourself and your team a disservice. Instead, focus on the people who stay. I agree with you Chuck. When you quit something after a few months, you haven’t even given yourself a fair chance to succeed. I think it’s best to look for people who are already business minded and success minded and understand delayed gratification. I really don’t know of any business where you are making good money, or any money, after 90-days. I think there is a disconnect and part of the problem is on distributors in the profession as a whole. Until people stop using so much hype and false promises they will continue to push people away from our model. Usually, the people who quit and the label it a scam are actually referring to the network marketing model as it was described to them. Unfortunately, desperate distributors often times describe it in a lottery mentality way just to “get” someone in the business. (ex. “it’s easy, you just get 3 and they get 3 and so on until you have 100,000 people in your business). We need to do a better job as an industry explaining that you will work hard (for years) and get 100+ people to join you. Those with the grit, determination, and staying power to last is how you’ll build leverage. For what it’s worth Chuck, I think you do a great job painting a realistic picture of this industry for people! Yes, a lot of people use hype. But a lot of people who join LOVE hype. They join because they think it is something for nothing. That hype appeals to their greed. That’s the same reason you see all of these ads online offering free and easy money with your own home-based business. Most of these are not even MLM Companies, but they are rampant because people are intrigued by the idea. As a MLM Distributor, we all have the responsibility to never use hype. We need to be open, honest and transparent. We need to give our new reps realistic expectations. The truth is any new business requires money, time and a BOAT LOAD of hard work. Most business owners don’t make a DOLLAR of profit their first year in business. You have to learn the skills, improve your mindset, and put in the work if you want to succeed in any type of business.